Mazza has been making authentic Middle Eastern Cuisine in Salt Lake City for more than 10 years. We believe that excellence in cuisine can only be achieved by using the highest quality and freshest ingredients available, with no corners cut in the process. 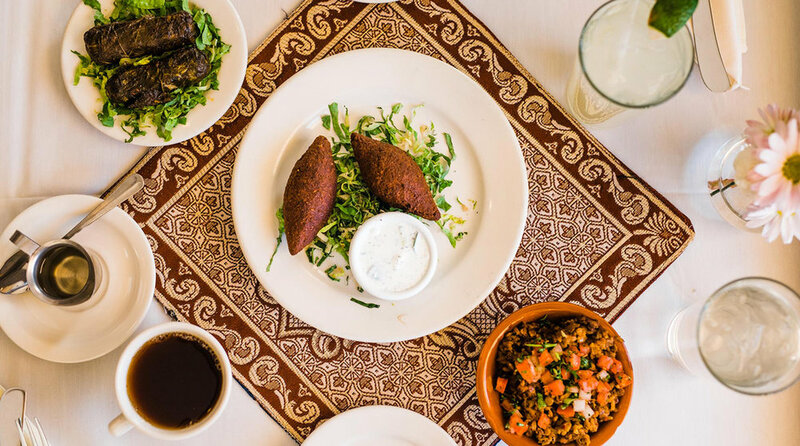 With two restaurant locations on 9th & 9th and 15th & 15th open for lunch and dinner, you can enjoy fresh, authentic Middle Eastern cuisine such as Falafel, Shawarma, Kebabs, dips and salads whenever you want. Our expansive menu includes specialty entrees prepared from scratch, using fresh, high quality ingredients. Mazza also boasts one of the largest selections of Middle Eastern beer and wine in the United States. And don't forget to try one of our desserts for the perfect finish to your meal! We proudly serve all-natural (no hormones, no antibiotics, all vegetarian fed) lamb, beef and chicken. We procure only the highest grade vegetables we can find and the best imported condiments and freshest spices available to us. Fresh cooked garbanzo beans blended smooth with lemon juice, garlic, tahini, and olive oil. Fresh roasted eggplant blended smooth with lemon juice, garlic, tahini, and olive oil. Traditional Lebanese staple of fresh strained yogurt, olive oil, garnished with olives. Tender green beans braised in a spicy blend of tomato, onion, garlic, and olive oil. Traditional Aleppan dip of walnuts, pomegranate molasses, toasted bread crumbs, olive oil, roasted bell peppers, and spices. Football-shaped appetizers made with minced beef, bulgur, herbs, spices, walnuts, pine nuts then fried to a perfect crunch. Shelled green fave beans braised in olive oil, onion, garlic, herbs, and pepper. Lentils and rice cooked in our seasonings. Finished with caramelized onions. Made fresh in-house with our blend of seasonings and pine nuts. Served on a bun with garlic spread, tomatoes, lettuce, and Armenian pickles. Mix of rice, chopped greens, herbs, and spices, wrapped in grape leaves. Slow cooked in a lemony tomato broth and served with yogurt sauce. Cubes of potatoes skillet-fried in garlic, pepper, cilantro, olive oil, and spices. Fresh cut and twice fried. Served with our aioli sauce for dipping. Fresh spinach, onions, garlic, herbs, and spices wrapped in a golden crust. Traditional Lebanese ﬂat breads baked with spices and aromatics and served with a side of crunchy cabbage salad. Uniquely delicious. A creamy and herbaceous combination. Richly seasoned ground lamb with tomatoes, aromatics, and spices. A rich blend of vegetables, spices, and seasoning. Chopped parsley, tomatoes, green onions, and bulgur ﬁwished with mint, lemon, and olive oil. Mixed greens, tomatoes, cucumbers, radishes, parsley, and green onions tossed with seasoned pita chips, pomegranate molasses, fresh lemon juice, and olive oil. Tomatoes, romaine lettuce, cucumbers, pita chips, olives, and Mediterranean cheese with our house dressing. Romain lettuce, cucumbers, tomatoes, radishes, and chopped green onions in our house dressing. Brown lentils, spinach, onions, garlic, herbs, spices, and olive oil braised to perfection. An aromatic blend of red lentils, onions, garlic, roasted tomatoes, and spices. Slow cooked and blended. Our favorite way for you to explore new options. Enjoy as an entree or share as an appetizer with friends. Choose a combination of dishes from our Starters & Sides and/or Soups & Salads. Freshly broiled meat or veggies, one skewer per order. Lamb sirloin with yogurt or tomato spread. Tender beef rubbed in our special blend of spices and broiled. Yogurt or tomato sauce. Chicken breast pieces marinated in lemon yogurt sauce with aioli. Marinated vegetables served with Tahini sauce. Seasoned ground lamb with onions, parsley, and spices served with hummus spread. One meat, and one veggie skewer, served over our special Basmati rice with your choice of one dish from our Starters & Sides or Soups & Salads. Crunchy balls of ground fave, garbanzo beans, herbs, and seasonings fried and served in a pita pocket with pickles and greens. Chicken marinated in lemon and yogurt sauce, broiled and served on a toasted bun with our aioli, tomatoes, and Armenian pickles. Thin slices of lamb and beef marinated in our blend of seasonings and cooked on a standing grill, shaved into a pita pocket with our blend of spices, tahini, fresh greens, and turnip pickles. Thin slices of chicken marinated in our blend of seasonings and cooked on a standing grill, shaved into a pita wrap with garlic-tahini sauce, fresh greens, and turnip pickles. Served in a pita pocket and garnished with garlic tahini sauce, fresh greens, and Armenian pickles. Tender skirt steak seasoned in our special blend of spices and aromatics, broiled to perfection, topped with "Akkawi" cheese and served in a toasted french bun with our garlic spread, pickles and veggies. Beautifully balanced. Add one or two sides along with one drink to any sandwich on our menu. Drinks Include: Tea, American Coffee, Fountain Drinks, or Homemade Limeade with orange blossom syrup. A medley of eggplant, garbanzo beans and onions braised in an olive oil, tomato, and garlic sauce. Seasoned with our mix of Mediterranean herbs and spices. For vegan V+, please request yellow rice. A rich blend of beef, okras, tomatoes, peppers, aromatics, herbs, and spices slowly braised to a delicate perfection and served over basmati rice. Our chef Jinan’s prized recipe for a traditional vegan meal that incorporates pumpkin, spinach, walnuts, bulgur, spices and aromatics to create the ultimate baked dish. Served over a crunchy salad and a side of tahini sauce for dipping. Richly seasoned mushrooms and caliﬂowners cooked in a complex blend of spices, aromatics, tomatoes, and saffron, served on a bed of rice and garnished with nuts & raisins. Layers of seasoned eggplant and chicken sautéed in a blend of onions and spices. Oven baked in a rich tomato, walnut, and pomegranate sauce and served with basmati rice. Our recipe uses traditional ﬂat, thin bread, stuffed with a mixture of golden fried onions, chicken, herbs, and spices with a generous drizzle of olive oil. The folded bread is baked and served with garlic dip and a side of crunchy salad. A wonderfully rich oven baked dish made of seasoned layers of chicken breast, potatoes and sweet golden onion slices baked in a tangy and sweet tamarind sauce and served over basmati rice. Tender, lean morsels of lamb sirloin cooked in a mixture of chopped spinach, onions, garlic, herbs, and spices. Finished with a dash of lemon juice and garnished with toasted pine nuts and almonds, served with a side of basmati rice. A delicious and lean cut of lamb, braised in a mixture of our signature spices. The dish is garnished with fried pine nuts and almonds and served with a side of cucumber yogurt sauce. Bone-in lamb shank braised in our special blend of aromatics, spices, wines, and liqueurs to a perfect tenderness. Served over our special basmati rice and a side of green salad. Lean all-natural beef mixed with our blend of spices, ﬁrely chopped onion and parsley, layered with seasoned fried potatoes and baked in creamy and tangy tajen sauce. Served over basmati rice. Our Mediterranean platter consists of a fillet of Mahi Mahi and a skewer of shrimp and scallops seasoned and broiled. Served on saffron barberry rice with our signature Tajen sauce with a side of green salad. Our seasonal Fall & Winter dishes highlight the best of Middle Eastern cuisine while incorporating local and seasonal ingredients. A hearty and rich stew of chicken and mallow leaves (AKA okra leaves due to their texture), braised with herbs, spices and aromatics, and finished with a lemon squeeze. Served with basmati rice and a small side dish of fresh relish. A truly unique culinary experience. Un-oaked aging. Easy going and smooth with aroma of earthy berries. Smooth tannins, plum, spice, and vanilla notes. Chocolate and black cherry aromas with a smooth mouthfeel. Smoke, cherry preserves and sweet herbs with a lengthy ﬁwish. From Lebanon’s most celebrated winery comes this young wine with cranberries, a peppery mouthfeel and a delicate ﬁnish. Ripe red fruits with aromas of lavender mint and earth tones. Enticing aromas of spices, pomegranate and anise. Rich, ripe black fruit aromatics, scents of chocolate and coffee. Juicy and complex with ﬂoral, sage, vanilla and eucalyptus aromas. A nice equilibrium between mellowness and liveliness with a woody ﬁwish. Suggested decanting time 30 minutes. This unique single vineyard wine is juicy with aromas of plums, cherry liqueur and white pepper. The perfect balance of oak, black and red berries with a hint of vanilla. Mellow ﬁnish. Truly one of the world’s great wines. Mature and complex with great balance and aromas of raspberries, violets and currants. Chateau Kefraya’s prestige wine with complex aromas of dark fruit, coffee and cedar. The nose is pear, pineapple and tropical fruits, and the finish is clean. It is a staff favorite. Tropical fruits nose, fresh and crisp on the palate with a hint of minerality. Balanced acidity and a generous finish. Aromas of roasted pineapple, candied lemon rind and honeysuckle, rich, fruit forward on the palate. Floral and honey finish. Crisp and refreshing with notes of grapefruit and pineapple. Intense and full bodied with tropical and citrus characteristics and subtle notes of toasty oak. Long smooth ﬁnish. Aged in French and American oak barrels. Subtle and buttery with honey and peach notes. Summer grass, strawberries and melons with a mellow ﬁnish. Floral nose with hints of strawberries and bright minerality. Bright and refreshing, with notes of strawberry pulp, grapefruit and apples. Fragrant aromas of oranges, citrus blossom and green apple are complemented by a long, refreshing ﬁnish. Made with regular and citrus vodkas and our blend of peach, strawberry, lime and rose water mixer. Refreshingly sweet. Our version of this classic New Orleans cocktail combines rye whiskey, Cognac, simple syrup and bitters in an Arak-washed glass, ﬁnished with an orange zest. Simple yet elegant. Lavender bitters stand out in this aromatic cocktail that combines High West Silver Oat Whiskey, St. Germaine liqueur and a splash of lemon juice. A cocktail with Middle Eastern ﬂavors. High West Silver Oat Whiskey, orange blossom syrup, cardamom bitters and a touch of club soda, garnished with cardamom pods. A unique combination of dry red wine with an apéritif and ﬂoral orange blossom rose water to wake up your appetite or to pair with your favorite samplers. Gin, crème de violette and lemon juice. Beautifully balanced ﬂoral notes. Whiskey, Cognac, Cointreau and bitters. Garnished with a Maraschino cherry. Our own take on a classic. Our own concoction of Whiskey, brandy, honey, citrus and spices, served warm. Perfect for those cold evenings. Please call (801) 484-9259 for reservations at 15th & 15th. © 2018, Mazza Middle Eastern Cuisine. All rights reserved.